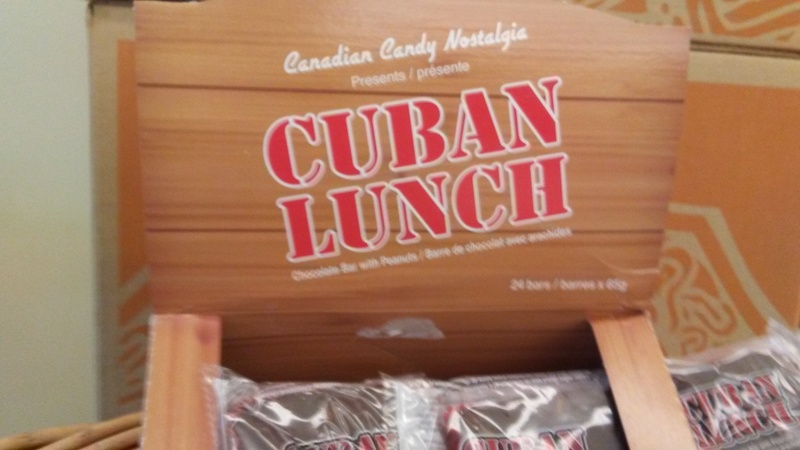 The Cuban Lunch is a true Western Canadian chocolate bar and hasn’t been made for almost thirty years. Thanks to a Camrose woman and her mother’s love of this chocolate-peanut candy, it’s available once again. Winnipeg claims to be the original source (this is hardly fair, they get Winnie the Pooh AND the Cuban Lunch?). Paulin’s and later McCormick’s made the Cuban Lunch until it was discontinued in about 1991[i] and the trademark was expunged. The Cuban Lunch may have been around since 1948 and may have received its name illogically from one of its ingredients, Spanish peanuts. Its most distinctive feature is the red frilled paper it’s wrapped in. Crystal Regehr-Westergard who lives in Camrose, Alberta, has resurrected the Cuban Lunch for her 84-year old mother. The process of restoring the Cuban Lunch was lengthy; Regehr-Westergard bought the trademark when it became available and then spent a few months experimenting with recipes. She (and her husband) found a factory in Delta, BC to manufacture the chocolate bar[ii]. I came across a whole stack of Cuban Lunches in the local Safeway store. I bought a couple – they are more chocolate than I remember, the peanuts were delicious – the calorie count is fairly high, 350 per bar, so I cut the bar into four pieces and consumed it slowly, over twenty minutes. I never heard of this chocolate bar. It sounds good. Does the calorie count go down further if you make th pieces smaller and the time longer? i.e. Six pieces over six hours. Oh yes, definitely, preferably if you run a half-marathon in the middle..